What is a GMO? 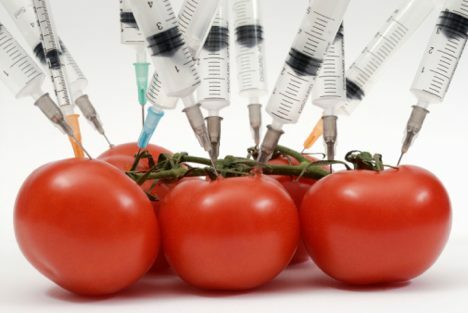 According to the Non-GMO Shopping Guide, "GMOs are genetically modified organisms made by forcing genes from one species, such as bacteria, viruses, animals, or humans, into the DNA of a food crop or animal in order to introduce a new trait." Sounds positively scrumptious. * Spider genes were inserted into goat DNA with the hope that goats' milk would contain the spider web protein. This protein would be used in bullet proof vests. - Changes in major organs and gastrointestinal system. How do we avoid GMOs? 1. Look for that beautiful USDA certified organic stamp of approval I love so much. 100% organic products cannot intentionally contain any GMO ingredients. You may also buy products that say "organic" or "made with organic ingredients" but in my opinion, it's best to look for the USDA certified label. 2. Look for the Non-GMO Project Seals. The Non-GMO Project is a nonprofit dedicated to providing consumers with explicitly labeled and verified Non-GMO products. They also test those at-risk ingredients. The Non-GMO Project verifies for individual products, not an entire brand. What do you mean, "at-risk ingredients?" Well, unless a product is both organic and Non-GMO verified, products may be made with with ingredients that are derived from GMOs. There are 8 GM food crops: corn, soybeans, canola, cottonseed, sugar beets, papaya from China or Hawaii (most) and a small amount of zucchini and yellow squash. Also be aware that GM alfalfa is fed to livestock. If a non-organic product made in the USA lists "sugar" as one of the ingredients and NOT "pure cane sugar," you can bet that it is almost always a combo of sugar from sugar cane and GM sugar beets. Also, dairy products may be from cows injected with GM bovine growth hormone. rbGH is manufactured by those bastards, Monsanto, and sold to dairy farmers. The hormone is injected into the cows to boost milk production by 10%. As a result, the cows are put at increased risk for mastitis, lameness, and reproductive complications. If your dairy products are not labeled "organic" or have that Non-GMO Project Seal on them, be sure to look for labels that state "No rbGH, rbST, or artificial hormones." Alternative Dairy Products: 365, Almond Dream, Amande, Blue Diamond, Coconut Secret, Dream Blends, Earth Balance, Eden, Field Day, Follow Your Heart, Galaxy Nutritional Foods, Good Karma, Growing Naturals, Honey Melt, Luna & Larry's Coconut Bliss, Mori-Nu, Nancy's, Native Forest, Organic Valley, Pacific Natural Foods, Purely Decadent, Rella, Rice Dream, Rich and Creamy Melt, Sambazon, Silk, Simply Soy Yogurt, So Delicious Dairy Free, Soy Dream, Soy Kiss, Soyatoo, Tempt, Tree of Life, Truwhip, Wayfare, WestSoy, WholeSoy & Co.
Vitamins & Supplements: Barlean's Organic Oils, Cando Natural Products, Chosen Foods, Ciranda, Coral LLC, DDS Probiotics/UAS Laboratories, Doctor's Best, Dr. Arenander's BrainGain & Oral Care Formulas, Essential Living Foods, Inc., Flora, Fungi Perfecti, LLC, Garden of Life, GlucoLift, Green Gem, Growing Naturals, HealthForce Nutritionals, Herbal Zap, Immortality Alchemy, Lekithos, Manitoba Harvest, MRM, Naked Coconuts, Natural Vitality, Naturally Splendid Enterprises Ltd (NS), Nature Built, Navitas Naturals, New Chapter, Nordic Naturals (brand I use for Cod Liver Oil) NOW Foods, Nutiva, Nutrigold, Oniya Organics, Powbab, Rainbow Light Nutritional Systems, Salba, Sambazon, Spectrum, Sunfood Superfoods, SunRidge Farms, Tempt, Traditional Medicinals, Tree of Life, Twinlab, Vega, Yummi Bears Organics (Non-GMO Shopping Guide, 2012). Non-GMO Shopping Guide. The Institute For Responsible Technology and Non-GMO Project, n.d. Web. 19 May 2013. <http://www.nongmoshoppingguide.com/about-gmos.html>. Non-GMO Shopping Guide. Institute for Responsible Technology and Non-GMO Project, n.d. Web. 19 May 2013. <http://www.nongmoshoppingguide.com/shopping-guide.html>. Organic Consumers Association . N.p., n.d. Web. 19 May 2013. <http://www.organicconsumers.org/rbghlink.cfm>.